Archbold’s Dakota Stamm races to the finish line at the 2018 OHSAA State Track and Field Championships. Stamm was a state champion in the 400 meter dash last season and she returns for her senior campaign. Matthew Gladieux throwing in the shot put during a meet last season. He is a key returning piece for Archbold boys track and field this season. 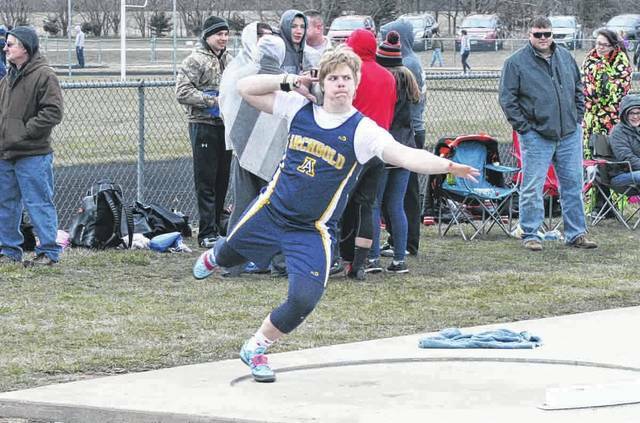 Archbold track and field is hopeful a good blend of returning letter winners and newcomers will result in success on the track this season. The girls team has the most back with four state qualifiers returning and one state champion. They are led by senior Dakota Stamm, a three-time state placer in the 400 meter dash and 2018 state champion. 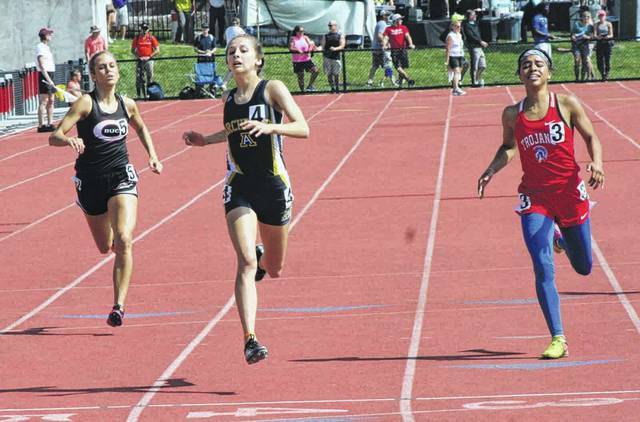 Joining her at state last season were Kylie Sauder, Brittney Ramirez, and Gwynne Riley, all who were part of the 4×400 and 4×800 meter relay teams. The Blue Streaks’ 4×800 team made the podium with an eighth place finish. “When you add those four to the rest of the team, I feel we will be able to score points at the invitationals in our area,” stated Gladieux. Also back for the girls are Shylo Richardson (regional qualifier), Kiera Gensler (regional qualifier), Cam Hudson (regional qualifier), Zoe Castillo, Gabby Cox, Delaney Garrow, Iris Pena, Regan Ramirez, Natalie Roth, Montana Stamm and Amberlyn Whitson. Gladieux is looking forward to watching the boys compete. The Streaks return 14 letter winners and have several newcomers, a group that includes nine freshmen. The main returnees for the Archbold boys are Trey Theobald and L.J. Tijerina who were regional qualifiers a season ago. Tijerina was third in the 100m at the district meet last season, while Theobald placed fourth in the 400m. They also get back juniors Matthew Gladieux and Mason Babcock who finished fourth and fifth in discus at the Northwest Ohio Athletic League Championships. The duo was fifth and sixth in that event at the Division II district meet. Other returnees for the Streaks are Caden Garrow, Tony Grime, Brendon Johns, Mason Kinsman, Daniel Oyer, Caleb Ranzau, Josh Richer, Austin Roth, Weston Ruffer, Spencer Short and Parker VonDeylen.